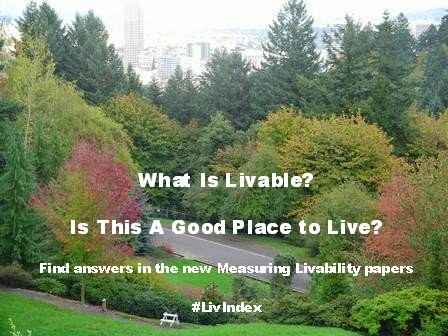 What Is a Livable Community, and How Do We Measure One? Today, I kicked off AARP Public Policy Institute's Livability Index project with a blog and two papers on new project webpage: bi.tly/LivIndex. The PPI blog, "What Is a Livable Community, and How Do We Measure One?" introduces the project to the world. You may have wondered why I haven't been writing as much lately, and this project is what has been keeping me busy recently. In a way, this has been keeping me busy for years. In order to complete my PhD dissertation, I had to come up with a conceptual framework to explain how people chose where to live. In that case, I applied it to the topic of modern racial segregation - having this framework helped me to understand how people end up in certain neighborhoods and why. The key to it is that people have a set of preferences, but they also have "mobility limiters" that limit their ability to find or move into neighborhoods that they desire most and reduce the possibility of getting exactly what they want - in this case, income, fear of racism, lack of preferred neighborhoods in a region, lack of information and other factors could limit their choices. (I plan to discuss this more in a later post). One of my committee members, Dr. Karen Kaufmann, made a comment that stuck with me - this framework could help us to understand housing and neighborhood choice for other groups. When we started this project a few years later, the AARP team wanted to find out what made a community livable and how we could promote policy solutions that would improve communities. From these questions, the #LivIndex project was born. We went around the country conducting focus groups, fielded a national survey on livability and gathered our results into a report. This research was guided by our analysis of previous efforts to measure livability, and we took the lessons from those efforts and our own research, and these lessons guide us as we develop a livability index of our own. We confirmed our suspicion that meeting the wants and needs of older adults leads to solutions that can also benefit younger generations. We also saw clear evidence that there is not one set of preferences or key issues for older adults - these depend on income, level of ability/disability, ethnicity, driving status and other factors. As I prepare to speak at the Diversity Forum at the American Planning Association's #APA14 next week, I realize that I will focus on sharing these lessons with the group. Look for more posts from me about this work over the next year. Several blogs are released today. read my AARP PPI blog, a blog by Sarah Goodyear in Atlantic Cities, and one by Sally Abrahms in the AARP blog - all are based on the research. Then visit bit.ly/LivIndex and let me know what you think of our work. I'll be leading a Webinar/ Twitter Chat next Friday, and if you are headed to #APA14 in Atlanta, I'll be speaking about this at Diversity Forum, and two of my co-authors, Jana Lynott and Shannon Guzman will be speaking about this as well. Follow me @DrUrbanPolicy on twitter and facebook, and I'm happy to continue the conversation. Please use #LivIndex for discussions of this work. I do not even know how I stopped up here, however I assumed this submit was once great. I do not realize who you are but certainly you're going to a well-known blogger in case you are not already. I haven't been posting often lately, as things have been pretty hectic. I did receive a question the other day about topic that I haven't spoken about here: Accessory Dwelling Units (ADUs), and it inspired me to write a quick post. These are sometimes known as "accessory apartments," "mother-in-law suites" or "granny flats" - they are ways to provide more housing options in existing neighborhoods by allowing homeowners to build additional units on their lots. ADU is a catch-all term for all of these situations - either units attached to existing homes or placed somewhere else on the property, say over a garage or a stand-alone in the backyard. The "Boom" in Golden Girls-Style Shared Housing: Where’s the Beef? NBC, Touchstone Television and their partners should be proud– it has been 22 years since the final episode aired, yet the influence of The Golden Girlsmeans that every year reporters ask about the boom in “Golden Girls Housing.” This form of shared housing receives a great amount of attention, but we'll miss the big picture if we look for big numbers. For the last few years, I have looked at data from the Current Population Survey (analyzed by the AARP Public Policy Institute) to count households that are all female (or all male) with at least one non-related housemate or roommate, no spouses, and no one under 50 in the home. This is the classic “Golden Girls” formula. AARP's Media Release for "What Is Livable? Community Preferences of Older Adults"